After an almost three-month hiatus, word is that one of the Winchester Brothers is back in Vancouver today, a few weeks early for director’s prep. Jensen Ackles (Dean Winchester) will be directing the upcoming season’s first filmed epsiode for the third year in a row. Shooting starts on Monday, July 9th. 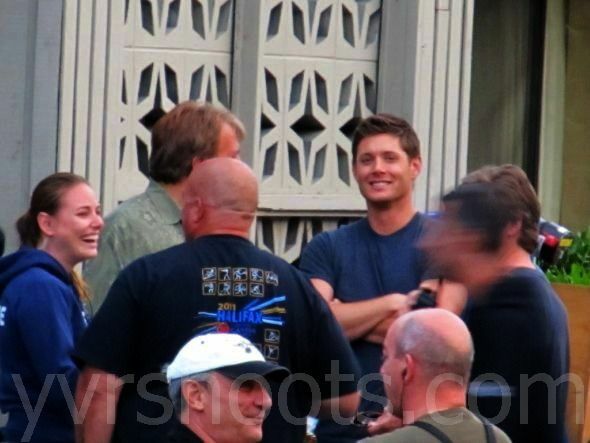 Jensen Ackles clearly enjoys directing. Last summer it was a Sam-centric episode three of season seven called The Girl Next Door, featuring co-star Jared Padalecki (Sam Winchester) and sci-fi goddess Jewel Staite of Firefly and Stargate fame (Amy). Six thousand lucky fans at San Diego Comic-Con should get a sneak peek of some of this summer’s Ackles-directed footage at the Supernatural panel in Hall H on Sunday, July 15th. Joining the Winchester brothers will be Misha Collins (Castiel), Jim Beaver (whose character Bobby might be really gone this time, making this panel a chance to say goodbye) and Mark A. Sheppard (Crowley). Departed showrunner Sera Gamble will not be there of course, making way for new executive producer Jeremy Carver and writer-producer Ben Edlund. Supernatural moves to a new night this fall: season eight premieres on Wednesday, October 3rd at 9 p.m. on The CW. Update: Jensen Ackles returned to Vancouver at suppertime. A fan told me she spotted him at LAX airport with his golf clubs heading to a mid-afternoon Air Alaska flight which landed at YVR airport around 5:30 p.m.
Update 2: Zap2It’s Carine Adly MacKenzie has some details about this season’s episode three called Heartache. Sam will be investigating a series of murders involving the Occult and somewhere along the way will meet a new love interest and doctor named Amelia, who has yet to be cast. I have loved both episodes that Jensen has directed so far and cannot wait to see what he gives us this time!!!! Watching the behind the scenes footage from him directing (especially when he talked about the woodchipper scene in “Weekend At Bobby’s”!) and listening to him talk about the differences in approaching things as an actor and a director. I am a huge fan of both guys and cannot wait for Season 8!!! Weekend at Bobby’s is a treasure…Girl Next Door had some high tension, and he worked it beautifully. I’m dying to see what Jensen gives us in season 8!!! Jensen’s not only a great actor he’s also a damn good director, he did an amazing and superb job as director in Weekend at Bobby’s and Girl Next Door now i am eagerly waiting to see his next directorial debut of Season 8, i am sure it’s gonna be superb. In fact i am sure we all fans would love to see more than one episode in next season under Jensen’s direction. WHERE (in Van’) is (1st) filming day goin’ on? Supernatural doesn’t make its filming locations public. The only way of knowing in advance where they will be is if someone finds a filming notice in their neighbourhood and that doesn’t happen very often. Hopefully they will be spotted somewhere on July 9th.